I wasn't sure where this post should go, so please move it if it's in the wrong place. 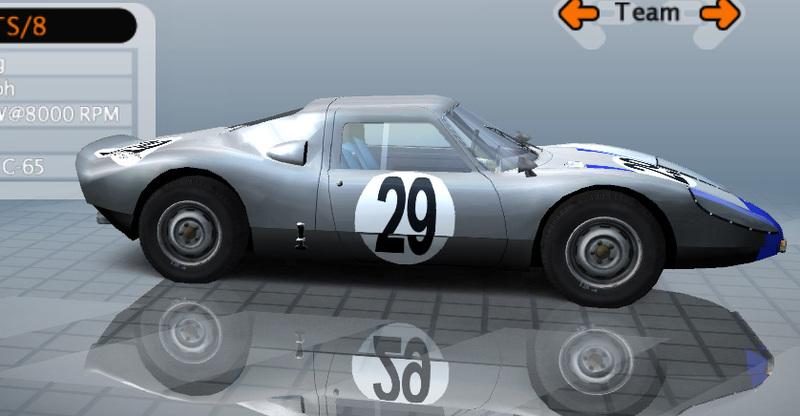 While setting up my field for Le Mans 1964, I came across a car that as far as I know has not been modded: the Porsche 904/8, which had a 2-litre flat 8 engine producing 176.5 kW / 240 PS / 237 hp (DIN) and 205 Nm / 151 ft-lb torque. The base drag in the .hdc is set at .20, which is difficult to understand, given that all the resources I have found say that the drag coefficient of the 904 was .33. In fact there are few cars, even today, that get anywhere near .20 - so I need to understand whether this was a workaround to get the mod to perform like the real thing, or do I misunderstand the 'BodyDragBase=(0.20)' parameter? I have created the 2.0 flat eight engine and put it in the 904/6 .hdc and left everything else pretty much the same (cannot find where one sets the fuel tank capacity though). I tested by letting the AI drive the 904/8, a 904/6 and a 904/4 at Le Mans 60, and the 904/8 times compared well to the times recorded, being about 10 seconds faster than the 904/4 and 5 seconds better than the 904/6. 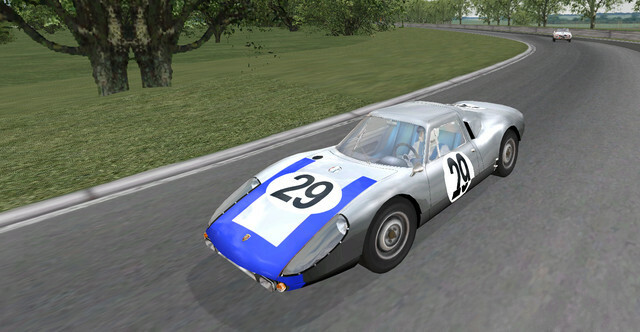 All that I need now is the skins for the two cars, #29 and #30, which can be found here: (http://www.racingsportscars.com/suffix/archive/Porsche/904/__8.html) - I am still working my way through the tutorials and setting up the software and learning, so I am not ready to do these two, need someone to do a proper job of creating the authentic originals. BUT the problem is, there are no pictures of the cars as they were then. Anyone please willing to help and offer additional advice, I may not have considered some variables/elements; I do this partly for my own convenience but also to learn. Base drag is not really comparable to real world CD numbers but proportionally between different cars it still works. For one thing most modders have the tire rolling resistance almost twice as high as it is in real life therefore the base drag number needs to make that compensation in order for the car to reach the correct real world top speed. When I do physics I use both base drag and rolling resistance changes to compliment each other. For example---Porsche maybe .23 and rolling resistance of say 1400 f and 1500 rear. Just an example --not my real numbers since I haven't looked. LOL---turns out these ARE my real numbers---memory 1---alzheimers 0 !!!! Perfect thanks Muddie, just shows I didn't really look properly for the cosmetic appearance, was more focused on the engine and technical specs. They look great, now I understand what racingsportscars.com referred to about the red and blue. I could probably do this in time, but given my current knowledge in this area, it would be a LONG time! 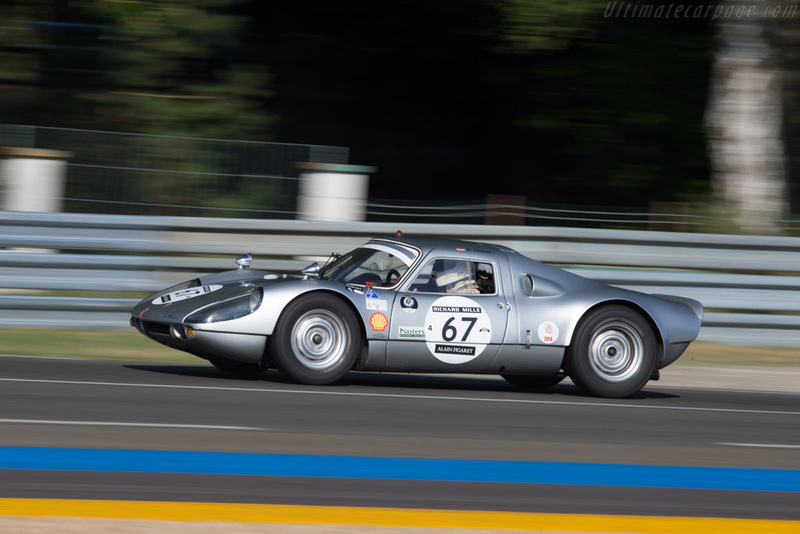 In fact, would be an excellent aquisition to our beloved GTL, if we have the 904/8 version. Okay it looks like I may have to do the skins myself, so you will need to be patient; I don't have as much time as I'd like, also have to make a living (damn) and I'm still learning. I also have to get permission from Butch to add this car in its two variants. Otherwise it will have to be developed from scratch, although it would be nice to be able to start with a base that had most of the variables already done. Perhaps I should PM Butch, although I'm not keen on invading the privacy of someone so busy and important. Have to look on an external HD whether there have been addon skins for the 904 - maybe also the skins #29 and #30 required. It's a real shame what has been lost due to NoGrip closure. Superb. MUCH appreciated! I have everything else necessary to make this work, will test asap, one skin to go! Looks GREAT thanks, will put them together with everything else and test. First setting is what it calculates the fuel capacity from, second setting is what increments it increases by, and third setting is maximum number of increments. In this case for fuel setting, it calculates from 1 liter, in 1 liter increments for a maximum capacity of 70 liters. Base garage setting is starting with 34 liters. Thanks very much, makes perfect sense. Not something someone could arrive at intuitively though; someone should write a glossary/explanation of what entries mean. Now its just the gearbox and we will be ready to present it for Butch's approval. I installed them both, cars run fine, but they are both plain silver, no colours or numbers. I looked in the tex.gtl file and I see references to files I don't have that refer to the original car I used as the base, like BODY2_MASK.DDS and WINDOWS.DDS so I assume those have to be done before the cars will look right? I checked all the file locations and naming conventions, everything else is correct. 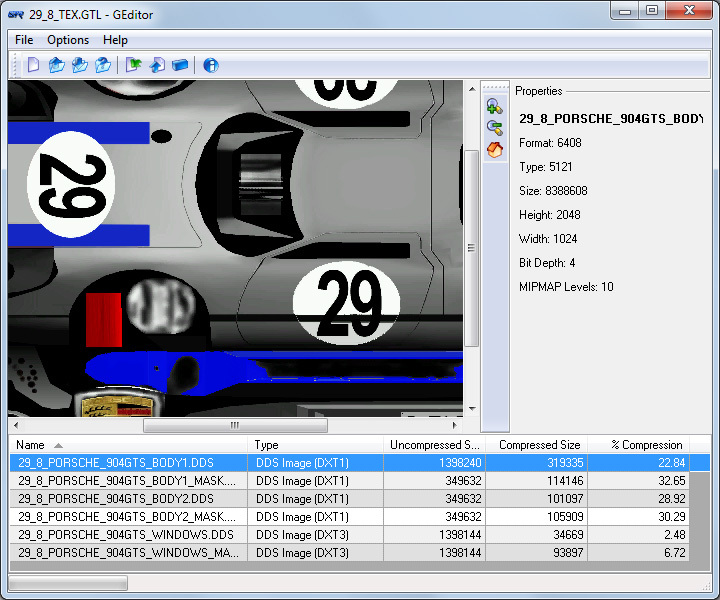 I opened tex.gtl with Geditor and I found all those files: should I merely save them as the prefixes for these cars? So I would save them with the correct name prefixes (e.g. 29_8_ instead of 18_6_ ) and then import them and then delete the previous ones? That is what seems intuitive to me, will try and if it doesn't work at least I will have learned something. then add all the files from an original folder and rename them correctly that includes the contents of the GTL files. Thats how i would do it, there may be other methods. That's pretty much what I did, but I must have made a mistake. Will go over it again. Thanks philrob, I'm learning a lot! Also finally used my GIMP DDS plugin, so getting more competent by the day! Went through everything, as far as I can tell it's all correct, but I must be missing something obvious, still have silver cars with no numbers or colours that go well. 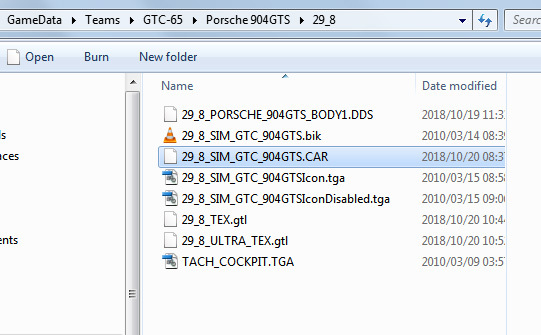 The CAR file refers to the new HDC (PORSCHE_904GTS_8.hdc, which clearly works) and the PORSCHE_904GTS.cas. Perhaps I am too close to it, cannot see why it should not work. just a guess looking at what you have not mentioned. You meant the CAR file but I changed it and BINGO! Now to repeat the process for #30, check on some technical details (the fuel tank capacity and gear ratios) and we are ready to roll!